CANDELS: What types of galaxies are there? What types of galaxies are there? If you have ever seen a night sky in a very dark area, chances are you've seen this white-ish band across the sky. This band is the Milky Way (see picture to the left), the galaxy we live in, our home. It stands out in the night sky because it consists of many, many stars. Like our sun is just one star in many billions in our own galaxy, the Milky Way is just one galaxy of many billions in the entire Universe. And like the people on our planet, galaxies come in many different shapes and sizes. Here, I will give you a very basic overview over the different types of galaxies we see in our local Universe. Most galaxies in the Universe have a very structured appearance, with spiral arms, clumpy star-forming regions, dark dust lanes, and sometimes bars in their centers. 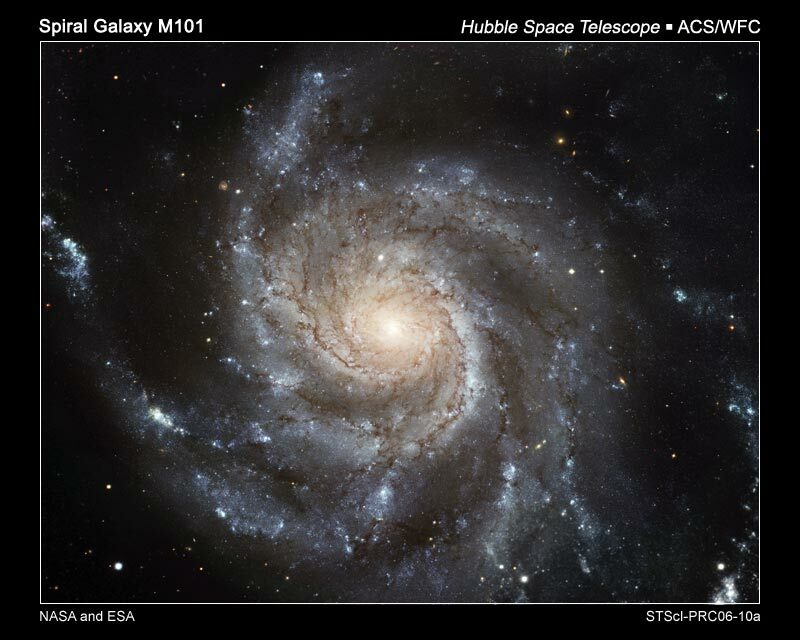 Because of their structure they are called spiral galaxies. 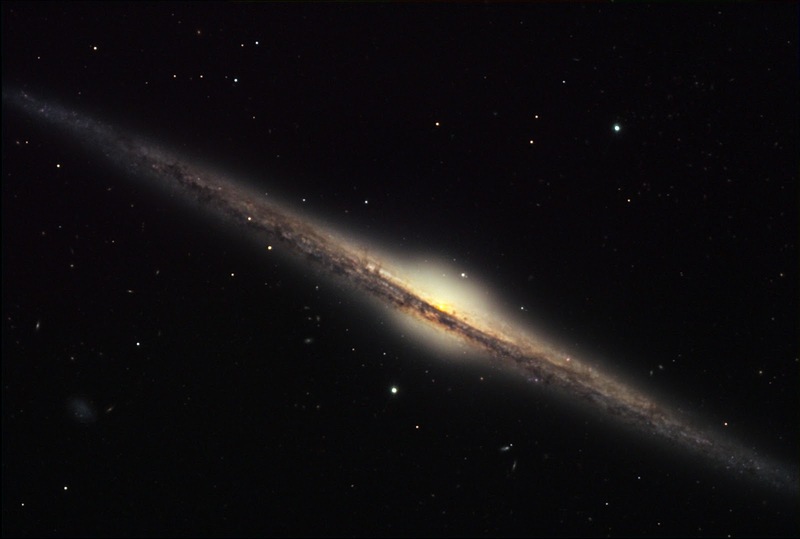 Spiral galaxies have a disk, a bulge, and a halo. The disk contains mainly gas, dust and young stars (and young means a few million years) which shine blue due to their hot temperatures (much hotter than our Sun). Star-forming regions, the birthplaces of new generations of stars, are located mainly along the spiral arms. The stars, dust, and gas in the disk orbit around the galaxy's center. The bulge in the center of the galaxy on the other hand consists of mainly old stars which are much cooler and thus red. This gives the bulge its distinct red colour. The halo contains only a small number (compared to the many stars in the disk) of old stars which often reside in clusters. While the spiral arms are best seen in galaxies that face us (we say the galaxy is face-on, like the one to the top right), we know they are very flat disks from the ones that are edge-on (like the one on the bottom right). Our own galaxy, the Milky Way, is such a spiral galaxy. You might ask, how do we know that seeing that we are sitting right in the galaxy and can’t look at it from the outside. Well, if the Milky Way were not a flat, disky galaxy you would not see that white-ish band across the night sky because the stars would not be concentrated in a thin disk but be more evenly distributed across the sky. From the picture of the Milky Way (first image), you can recognize dark structures in the white-ish band of stars. These are created by dust and gas between us and the stars which block out the light of these stars. In contrast to the structured spiral galaxies, there exist galaxies that are very smooth, in which the stars are evenly distributed and that have pretty much no structure at all (like the galaxy on the left). Because they are of elliptical shape, we call them elliptical galaxies. Most ellipticals are red in colour because they consist of mostly old stars and they do not form new stars. It is also believed that they contain very little to no dust and gas, unlike spiral galaxies. Elliptical galaxies are in many ways very similar to the bulges of spiral galaxies. Both the biggest and smallest galaxies in the local Universe are elliptical galaxies. The light in the largest ellipticals takes more than 2 million years to travel from one end of the galaxy to the other. 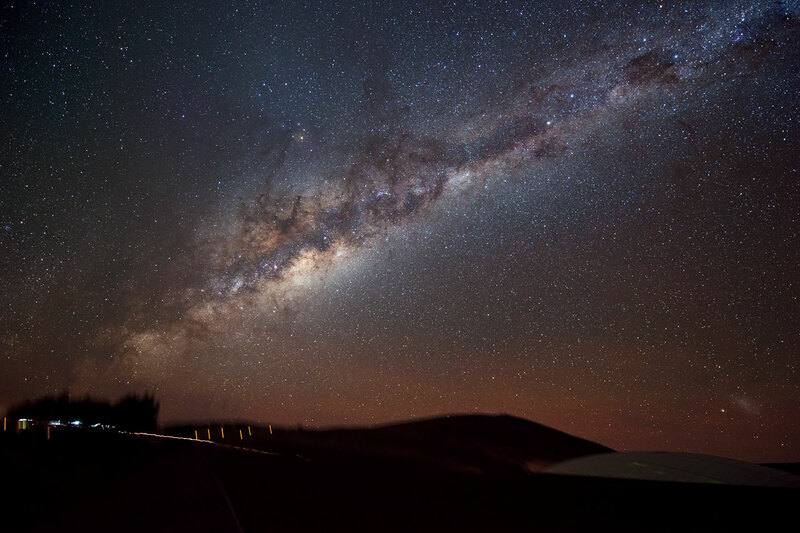 In comparison, the light from one end of the Milky Way needs about 100,000 light years to travel to the opposite end. The smallest ellipticals are also the faintest galaxies; they are called dwarf ellipticals. There are a few such dwarf galaxies around the Milky Way which are likely to be swallowed by our own galaxy over time. As you might have expected there are also galaxies in the local Universe that don’t really fit in either of the above categories. Their shape is usually irregular and they are forming a lot of stars. We call them irregular galaxies. 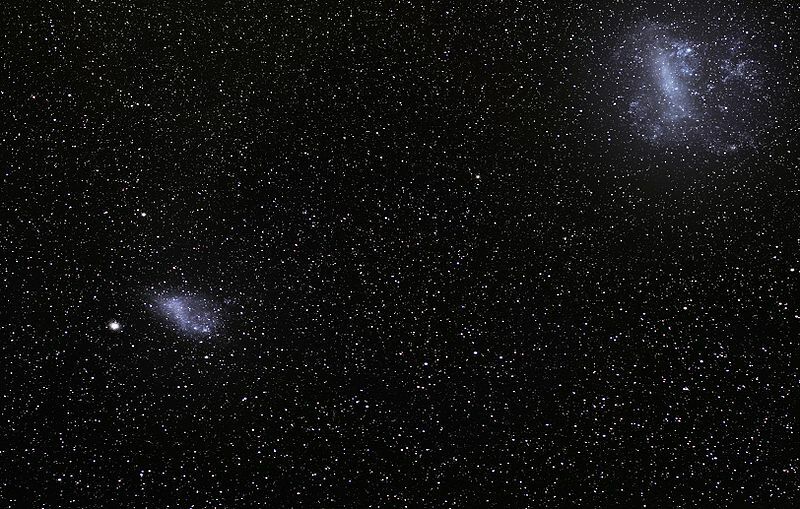 The most prominent examples are the two Magellanic Clouds, our intergalactic neighbours. However, even among the elliptical and spiral galaxies appearances vary. 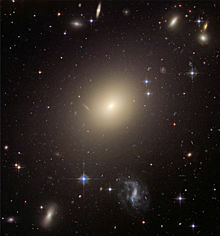 For example, an elliptical galaxy can be nearly spherical or very elongated. The spiral arms of spiral galaxies can be tightly wound or rather loosely wound, its bulge can be larger or smaller. There can also be a bar in its center. The first to order galaxies not only by elliptical (E) or spiral (S) type was the astronomer Edwin Hubble. In this classification scheme (see figure to the left) a number is used to describe the roundness of ellipticals, e.g. an E0 galaxy is pretty much round, while an E7 galaxy is extremely elongated, like a cigar. Spirals are divided into two subgroups, those with a central bar (SB galaxies, barred spiral galaxies) and those without (S galaxies). Our Milky Way is a barred spiral. Small letters describe the size of the bulge and the tightness of the spiral arms, e.g. a Sa galaxy has a relatively large bulge and very tight spiral arms, a Sc galaxy has a smaller bulge and the arms are very loosely wound. S0 galaxies build the bridge between the two basic types. These are galaxies that look like ellipticals but have a disk, although without spiral structure. Because of the shape of the diagram this classification scheme is also often referred to as Hubble’s Tuning Fork. 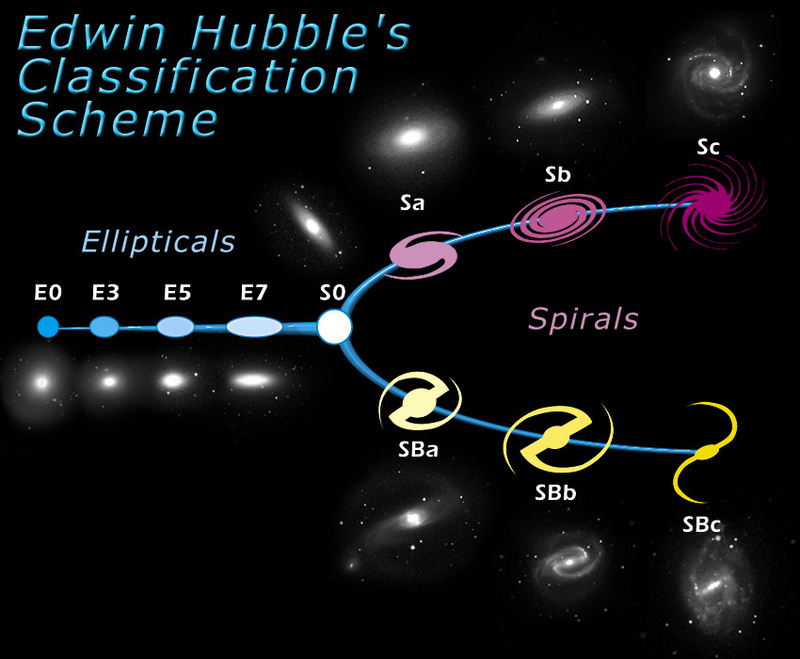 Morphological classification schemes like this are still in use today, most famously in the citizen science project Galaxy Zoo which allows the general public to classify real galaxies. An increasingly popular method in astronomy to study the galaxy population in the Universe is to take a large survey, i.e. to look at many galaxies instead of just a few. This helps us to make more general statements about the galaxy population by averaging the properties of a large number of galaxies. Thanks to the Sloan Digital Sky Survey, which mapped more than a quarter of the sky, we know a lot about the galaxies in the local Universe. However, many astronomers are interested in the formation and evolution of galaxies over time which in part means to answer the question: Why do galaxies in the local Universe look the way they do? To answer this question we need to study galaxies that are much further away and which existed when the Universe was only a few billion years old (in comparison, the Universe today is about 13.5 billion years old). 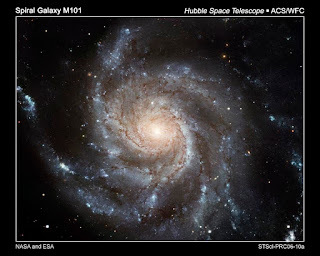 With the Hubble Space Telescope we are able to find far away galaxies which appear much fainter than close-by ones and map the distant Universe. From this we already learned that distant galaxies can look much different compared to the ones we see nearby (see for example the image of the Hubble Deep Field). However, the light of distant galaxies gets stretched and shifted to the red on its way to us (this is called redshift) and thus what we can observe of distant galaxies by analyzing images is difficult to compare to what we observe locally. With CANDELS we are able to observe far away galaxies in the same light as local galaxies. This will allow us to directly compare galaxies and to understand how distant galaxies evolved. In future posts we will tell you more about the distant Universe, the shape of galaxies, interactions between galaxies, and the properties of galaxies. So stay tuned! Spy Satellites to Look Up?